A hundred years ago, with the seven kingdoms on the brink of destruction after centuries of constant war, one princess gathered the younger members of each nation's royalty and nobility to a mysterious island, hoping to use the proximity and neutral ground to foster understanding and form connections that would lead to peace. She succeeded beyond anyone's expectations. Thereafter, every seven years, each kingdom sends seven delegates from among its best and brightest for a seven-week Summit, to form alliances and strengthen international relations. Over time, however, much of what was learned during that first Summit has been forgotten. The peace that was formed a hundred years ago has never been closer to falling apart. You, the player character, are one of the delegates arriving on the island for the latest Summit, from any of nine possible backgrounds and with any number of possible goals to achieve. You might find love, form an advantageous political alliance, solve a mystery, maybe even influence the state of the world as you know it... if you can survive long enough amidst the Summit's tangle of secrets, hidden motives, and cutthroat politics. 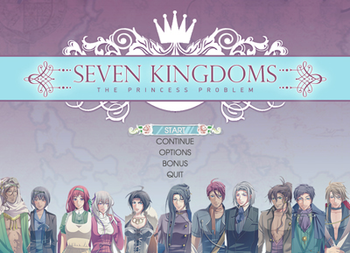 Seven Kingdoms: The Princess Problem is a Ren'Py-based Visual Novel by Azalyne Studios for PC and Mac. Described as a "Romance Game / Political Fantasy," the game involves honing a broad array of skills and knowledges in order to most effectively interact with its cast of characters and uncover the secrets going on beneath the surface of the Summit. A demo was released in June 2015, available for download from the official website . The game went to Kickstarter in August 2015 and smashed through all of its initial stretch goals within the first two hours. In January 2017, Azalyne Studios released a limited-time version of the demo extended to include new content through week five of gameplay. Achievement System: There are various achievements to be unlocked by clearing certain events in the game. They don't have any effects on gameplay, and are there purely for fun and/or bragging rights. All Part of the Show: If the main character can salvage the theatrical in week five, it is largely by virtue of applying this trope, staying in character and finding ways to incorporate the various mishaps into the story. Altar Diplomacy: Present all over the place, and one of the Summit's main goals. Arland in particular is known for their sheer number of diplomatic marriages, going back to even before the tradition of the Summit was founded. Amazon Brigade: Women are considered the tough and durable gender in Skalt, so they are the leaders and warriors of their culture. The Skaltic delegation for the game's Summit is composed entirely of warrior women led by Princess Anaele. Ancient Tradition: There is at least one secret society at work behind the scenes of the Summit, with hints of possibly more than one. By investigating and successfully gathering clues from week to week, the player character can discover more about them, potentially leading to a scene during the fifth week in which Jasper and Yvette are both confirmed to be members of the Historians, an Ancient Tradition with a directive to observe and record events without interfering in them. Asian and Nerdy: Clearly in mind with regards to the design of the Jiyel contingent. The country has a Far East flavor and chooses its delegates based on their intelligence and academic prowess. Romance with Prince Zarad runs along these lines, albeit with most of the belligerence supplied by the player character. The dynamic is beautifully illustrated in their first meeting - swept will you or nil you into dancing with the prince, you have the opportunity to respond to his nonstop flirting with an equally nonstop barrage of cheerful insults. Zarad is delighted. A relationship with Prince Jarrod inevitably involves a very high degree of belligerence, and requires you to be willing and able to stand up to his arrogance and aggression. Big First Choice: The choice of which delegates (if any) you introduce yourself to at the start of the Summit largely determines with whom you will be mainly interacting for the next few weeks. The game graciously warns you of the importance of this choice beforehand, however. Related but less immediately obvious is the choice of how early you do or don't arrive to the welcome feast, which in turn impacts how much time you have for mingling. Blue Blood: Owing to the game's premise, pretty much every named character in it who isn't a servant is a noble, if not a royal, of some kind. Buffy Speak: A quirk of language barriers means that the Skalt delegates - with Anaele the foremost example - tend to fall into occasional comical syntax. Color Motifs: Red, along with its traditional associations with danger, is the color of death and mourning in Revaire. The Revaire player character notes the color symbolism on more than one occasion during her personal plotline, in which an unknown person trying to blackmail her marks their messages to her with red flowers. If you are playing Story Mode instead of Challenge Mode, this is how your character survives the sabotaged horse ride if you don't pass the skill checks: just before your horse can plunge over a cliff, a hawk accidentally drops its captured rabbit in front of your horse, causing it to rear up suddenly, change directions, and drop you to the ground, which saves your life. Your character thinks she must have been "born under a lucky star". It happens again in week five if you don't pass the necessary skill checks to save yourself when someone tries to drop the balcony set on you the night before the theatrical. Specifically, a stable boy sees you wander into a dark room and comes in to check to see if you're okay, and he arrives in time to pull you out of the way before the balcony set can fall on you. Decadent Court: The royal court of Corval is famously decadent and intrigue-riddled. The Corval "Court Lady" background requires, and gives further bonuses to, social and political savvy. Died in Your Arms Tonight: Making the wrong choice or failing the associated skill checks (in Challenge Mode) at a key point in week five results in the player character dying in the arms of her distraught love interest. The game has two modes of play. In Challenge Mode, skill checks are harder and failure may result in your character being sent home in disgrace or getting killed before the end of the Summit. In Story mode, meanwhile, the skill checks are more forgiving and you're guaranteed to at least make it to the end of the Summit alive. Additionally, some origins are easier to play than others. The Hise Pirate, with no unlock conditions and hefty stat and knowledge bonuses right out of the gate, is the easiest. On the other hand, the Sheltered Princess and Tomboy Countess origins start off with mandatory limitations on some stats - the Countess even takes a stiff penalty to Etiquette - making them less versatile and more difficult to play. Even Duty-Bound Countries Have Standards: According to the creator, one major difference between the countries of Arland and Wellin is that while Arland is much more conservative than Wellin is, it's also less hypocritical, as in Arland, everyone is bound by duty, including the powerful male nobles. Everything's Better with Monkeys: Hamin thinks so, anyway. On conclusion of the midnight picnic, he suggests that next time there should be more monkeys. Fantasy Counterpart Culture: At least half of the eponymous kingdoms are based on a real life prototype: Skalt is a matriarchal Proud Warrior Race from the Grim Up North who evoke Horny Vikings without the ships, Hise is a land of Dashing Hispanic Pirates, Corval is inspired by Arabian Nights, while Jiyel is a mixture of Imperial China and Japan. Far East: Jiyel. Mostly Chinese, with a few hints of Japan in their military doctrine, general isolation, and size. Fission Mailed: No matter which stats you've raised and which decisions you make, in your first meeting with the Matchmaker, the Matchmaker will always decide that she doesn't feel confident about recommending you to anyone. However, you aren't actively kicked out of the Summit, and you are soon informed that you will have a second meeting with the Matchmaker later on, and thus the game continues with you preparing for this next meeting in hopes of changing her mind. Foreshadowing: During a possible outing with Prince Lisle, while you, Lisle, and Penelope are riding horses, your character's narration jokes that your horse is trying to murder you. In week 2, a horse does almost kill you, though it isn't intentional as someone else slipped a thorn under its saddle. Graceful Loser: Most of the possible love interests, with the exception of Gisette and Jarrod, are disappointed but understanding if you choose a match with someone else. Heart Is an Awesome Power: Etiquette is an easy enough skill to overlook, but it's easy to grow, makes you far more likable, and even shows up in a few tests. Horseback Heroism: Among the possible results of the disastrous horseback excursion in the second week sees Hamin, Zarad, or both together riding to the player character's rescue. Horsing Around: The protagonist gets stuck with a misbehaving mount during Prince Lisle's week one outing. Her skills determine the means at her disposal for dealing with it. I Can Change My Beloved: Discussed and defied by the Matchmaker in regard to Jarrod: he is a bully and you cannot change him, and she will never approve a match with him. A very persistent MC can ignore this and begin a secret relationship with him, but whether or not he can actually be changed remains to be seen. His behavior in the extended demo suggests not. Idiosyncratic Difficulty Levels: The game's "Story" and "Challenge" modes are the "easy" and "hard" modes, respectively, since Story mode guarantees that you will at least make it to the end of the Summit. For example, in Story Mode, the sabotaged horse in Week 2 cannot kill you; if you don't pass the skill checks, a hawk will save your life by accident. For another example, in Story Mode, if you don't manage to change the Matchmaker's mind in Week 3, she'll give you her stamp of approval anyway, because Jasper passionately defended you off-screen. Incompatible Orientation: Lord Blain's flirting is immediately shot down by Princess Anaele, who prefers the ladies in general, and the player character in particular. Prince Lisle doesn't reject marriage, but still can't be romanced. I'm Taking Her Home with Me! : Penelope has this effect on the player character if you take the time to start a friendship with her. In a conversation with Lisle, he and the PC end up spending a few minutes joking about working out a shared custody arrangement. Subverted. Don't assume that the relationship status screen is showing you everything about who you can or can't romance. There are several secret romance options, and at least one character with a visible Romance slider who it's impossible to form a love relationship with. Played straighter with the groups named on the Approval status screen. The existence of faction approval sliders for specific groups outright spoils the existence of La Résistance and provides a significant hint towards the existence of two other secret factions. There could be a more innocent reason for your approval levels among historians and weavers to be important enough to be included and tracked, but paying attention to what kinds of actions affect your approval with which factions provides a fairly telling indication of their true nature. I Want My Beloved to Be Happy: In the vein of Graceful Loser above, most romance interests seem regretful but wish you well if you choose to bow out of their romance paths at the end of week three. Their romance points even convert to friendship points. As above, the royals of Revaire are definite exceptions (unless you are very, very good at smoothing things over). La Résistance: Hinted to be in action in Revaire, opposing the current regime's takeover of the country. They're almost certainly active at the Summit as well, judging by hints in Jarrod and Clarmont's pre-Summit POV stories and a secret conversation the player character can overhear between Jarrod and Gisette. One of the unlockable secret origins for the player character makes her a leader of the rebellion. Attempted during the second week. Someone put a thorn under the saddle blanket of your horse to agitate it into running away with you, intending to get you killed in a way that looks like an unfortunate accident. If you're playing Challenge Mode, it may succeed. The Tomboy Countess is suspected of arranging "accidents" for her unwanted suitors; you get to decide for yourself whether this is true or not. Either way, someone at the Summit takes it upon themself to invoke the trope, causing suspicious "accidents" among your suitors in an attempt to get you blamed for it. In the extended demo, the death of the servant Lee turns out to be an attempt at making it look like an accident that went wrong. If you're able to connect all the dots and get the full explanation, Kade admits that he tried to use the same tactic on Lee that was used on the protagonist in week two, but Lee recognized that there was something wrong with his horse so Kade had to knock him out and tie him to the saddle, making it obvious that foul play was afoot. And again in week five of the extended demo, when person or persons unknown lures you to the set of the upcoming theatrical and tries to drop the balcony set on you. As in week two, if you're playing challenge mode, this can succeed. Mix and Match: The official website pitches the game as an odd love child of a BioWare-style RPG (specifically, Dragon Age: Origins) and an Otome Game. More Friends, More Benefits: Romancing as many delegates as you can during the first three weeks is the best road to increasing your stats, both through the bonuses earned from successfully completing a character's invitation event and the stat-raising gifts you receive from your admirers in the third week. Characters who like you enough can also fill in for skill checks that you would otherwise fail - some of which are both crucially important and very difficult to pass on your own. Since romance points convert into friendship if you don't begin that character's full path at the end of the third week, there are no drawbacks to following this strategy unless you jilt one of the royal Revaire siblings and aren't a very, very smooth talker. Morton's Fork: The Matchmaker will find some kind of fault with any decision you make during your first meeting with her, no matter what it is. Argue that you don't think hoping to find love is too much to ask, and she'll deride you as hopelessly naive; state that love has no place in political marriages, and she'll disparage you for being too cynical. Attempting to hedge your bets just gets you called out for not being willing to take a firm stance. You later learn from Ria that she's like this with everyone on first meeting. Multiple Game Openings: Played with. The game always starts with a Player Personality Quiz that functions as character creation, but after that, you are allowed to pick one of the playable backgrounds you've unlocked with your final stats. Each background then gets a unique flashback that allows you to further refine the PC's personality, and is regularly referenced later in the game. There are even secret backgrounds unlocked by triggering certain events. Mystical White Hair: Natives of Vail have naturally silver-white hair, contributing to the air of mystery that lies over the island. New Game+: Not in effect in the demo, for obvious reasons, but Aly has stated that successfully completing the game will provide a bonus when starting a new game. Additionally, the three "more than you appear" backgrounds must be unlocked by completing a play through the game with specific objectives met. Nice to the Waiter: Not only can you learn a lot from how any given character treats the servants, other characters will just as easily draw their own conclusions about you based on the same thing. You have various opportunities to be friendly or rude to your own personally-assigned servants and others around the Isle, with consequences depending on your behavior. Out-of-Genre Experience: After three weeks of social interaction and political maneuvering, week four is almost entirely occupied with solving a murder mystery. Just about any exchange of dialogue with Lady Avalie is a verbal duel. She is never remotely impolite or inappropriate, but god help the unwary soul who engages in conversation with her unprepared for a battle of wits. With high levels in Eloquence, Etiquette, and the stats that contribute to quick-wittedness, the player character can likewise become a master of artfully-veiled verbal jabs and ripostes, and in the process earn respect from characters who appreciate that kind of skill. Pelts of the Barbarian: Princess Anaele of Skalt comes from a Viking-inspired Grim Up North culture and dresses accordingly — in light battle armor and a cloak with a massive fur collar — despite being a representative of her country on a diplomatic summit. Her entourage follows suit, showing off their fur-trimmed clothes, — and it is strongly implied that they do it on purpose, to annoy the rest of the delegates and to demonstrate that they prefer swords over words. Each week, there are a certain number of secret scenes and events you can encounter which are only available for that week. Many of these scenes are linked to the various mysteries of the Summit, and missing even one event in a given secret chain will render it impossible for the player character to resolve the mystery later on in the game. One such example within the demo is the challenge of figuring out who tried to get you killed during the horseback excursion in week two; if you haven't seen the relevant scene before the event in question, the trail goes cold and there's no way to solve the mystery which will also prevent you from fully solving the murders in week four. Unlike many of the other skills, the Insight stat cannot be raised in character generation or via any of the free time stat-raising activities. Instead the skill is raised almost exclusively by making conversational choices that demonstrate your understanding of the other person. While opportunities to do so exist throughout the game, by far the most Insight gain chances take place during the welcome feast on the first daynote up to as much as 80 points; by comparison you might gain another 15 points in Insight between the welcome feast and the Matchmaker's second interview in week 3, and if you fail to make the right choices there, you're left with a woefully low score in an extremely useful stat which has significant influence over whether or not your character will be able to figure out various mysteries and puzzles she encounters throughout the rest of the game. Such as, again, who tried to kill you in week 2 and the murder mystery in week 4. Pirate: Hise is essentially a whole nation of pirates. Hamin is a pirate captain, and so are you if you play the Hise origin. Player Personality Quiz: Character creation is framed as the protagonist relating various episodes of her life to Jasper, with your replies increasing certain stats. Please Don't Leave Me: Every love interest says some variation on "please don't go" or "stay with me" if you get killed during week five. You get one from the Matchmaker during your Week 1 interview with her, regardless of which stats you raise or which choices you make. During week 3, Sayra, one of your maids, gives one to a drunkard who was harassing a servant girl. There is not just one, but a set of relationship value meters for each character, the ratings of which are affected by your actions and your interactions with them. The meters are Friendship, Romance, Rivalry, and Respect, although not all four are available for every character. Additionally, a separate set of values tracks how much or how little approval your actions have earned you from various larger groups of people, from the common folk and merchant class to significant factions from each of the seven kingdoms. Having such factions supporting you has benefits, and this kind of approval is crucial if you want to do something like marry someone from your own country rather than accept a match of political value. Romance Sidequest: Despite the game's Dating Sim influences, romance is actually optional and secondary to building non-romantic relationships with other attendees. Though of course, it is what most players are here for. Ruling Family Massacre: The current ruling family of Revaire purged all of the descendants of Princess Katiya's bloodline and their supporters in a bloody coup when they took over the throne. Lord Clarmont is noted to be one of the last courtiers with "old blood," making it even more of a mystery how he's managed to keep enough favor with the court to be selected as a delegate. Secret Test of Character: A few characters will stage these for you to determine if you're worth their interest. How you handle an incident with a servant girl, and what your actions reveal about your sense of compassion and ethics when you think nobody but the servant is watching, determines whether or not you can successfully complete Lord Clarmont's week one event. It's not quite clear how much of it was arranged in advance, but Prince Zarad deliberately hangs back to see whether you'll rise to Avalie's attempt to bait you or if you're insightful enough to see through her and avoid jumping to conclusions. Fail, and you'll lose his interest. Princess Gisette invites you to a pleasant romantic afternoon with her. Actually, she invited you to a small party with some other ladies, which she didn't tell you about and which started well before you arrived. Then she accuses you of lateness, and then wants you to come up with something slanderous about another lady she wants to ruin. She wants to know that you can, A, think on your feet, and B, follow orders. Basically everything the Matchmaker does is a test. In just one specific example from your first meeting with her, when asked to prepare and serve tea you notice an herb that induces mellow and friendly feelings, at the cost of severe stomach trouble afterwards. You can choose to slip some into the Matchmaker's tea or take the high road - either way, afterwards she lets you know she's observed your choice on the matter and what she thinks about it. Shrinking Violet: The flustered and as-of-yet unnamed Serving Girl Sayra goes to rescue late in the demo is example. The extended demo reveals her name - Imogen. Skill Score: You know how in most RPGs, all of your stats relate to combat in some way and your social capacity is relegated to a single score? Well, in this game, you have a single Self-Defense stat and over a dozen different social skills that you have to grind independently. Sliding Scale of Gender Inequality: According to Word of God, one of the major themes of the game is "the struggles and dilemmas and limits placed on the women in stereotypical feminine roles in historical fantasy/medieval politics," and the subtitle 'the Princess Problem' refers to these issues. Five of the seven kingdoms favor men and expect submission from women, especially the very conservative kingdom of Arland, which is known for raising princesses to marry off to other nations as a form of diplomatic currency. The pirates of Hise, who primarily value skill rather than bloodline, are the closest thing the setting has to an egalitarian nation; Skalt is a woman-dominated society where women are the leaders and fighters while men are expected to care for the home. Smart People Play Chess: The setting's analogue for chess is a strategy board game called onvu. Unsurprisingly, all of the named characters from Jiyel are skilled players; interestingly enough, so is Sayra. Story Difficulty Setting: The game has two difficulties: Challenge and Story, with the latter being specifically pitched to players who want to see the game through without having to excessively optimize their character builds. Together in Death: If you die in week five while engaged to Hamin, the Please Don't Leave Me dialogue strongly implies that the love interest in question is going to commit suicide in order to "come with you." "I love you, [MC]. Let's go together." Unwinnable by Design: It's impossible to come out of character creation and the welcome feast with stats high enough to impress the Matchmaker during your Week 1 meeting with her. This is justified by Ria's explanation that the Matchmaker is "especially hard on" people she's only just met, like your player character, which also explains some of her more arbitrary criticisms. Fortunately, she's just as tough on everyone else, so you won't get kicked out of the Summit no matter how badly you fail the initial meeting and you'll get a second interview with the Matchmaker during Week 3. In Challenge Mode, even building your character is often essential. Spread yourself too thin, and you'll fail many tests. Overspecialize, and you won't be well-rounded enough to make it past Week Three. On a more minor level, several characters have stat and/or personality requirements that you must meet in order to even begin a relationship with them. If you don't have the necessary stats out of character generation, in many cases there is not enough time to make up the difference before it comes time for the Matchmaker to recommend a marriage for you - good luck trying to get matched with Duke Lyon if you don't start off with above-average Intelligence, for example. Widow's Weeds: Red is the traditional color of mourning in Revaire, and widows in that country are expected to wear red for a suitable period after their husband dies. When generating an Ambitious Widow character, the player may choose whether she followed this custom, gave it lip service by wearing red only in public, or ignored it altogether. You Lose at Zero Trust: Forming relationships with the other attendees of the Summit is crucial to success in the game. In Challenge Mode, failure to build ties with your fellow delegates or earn sufficient approval will get you set home in the third week even if your stats pass muster. Your Days Are Numbered: This applies to you, if you're playing the Jiyel player character, as you receive a note addressed to your cousin that has been laced with poison. However, so far, you're able to delay death with a special flower.